“A tremendous group of individuals and organisations have accepted an invitation to become honorary Founder Supporters of Clean Air in London. They are being honoured for having encouraged and assisted the Campaign for Clean Air in London since it was formally established on 1 February 2007 and for their strong ongoing commitment to the improvement of air quality in London. Clean Air in London took over responsibility for the campaign from The Knightsbridge Association on 11 November 2010. “Honorary Founder Supporters include Ken Livingstone, the former Mayor of London, and leading politicians from the four main parties in London as well as several of the most respected civic, environmental and transport charities. I must mention particularly Darren Johnson AM, Murad Qureshi AM and Mike Tuffrey AM for their constant day-to-day support over many years. The leading charities include the Campaign for Better Transport, ClientEarth, Environmental Protection UK (formerly the National Society for Clean Air), Friends of the Earth and the London Forum of Amenity and Civic Societies. 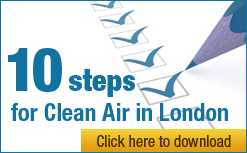 “Mayor Johnson has written personally saying ‘I fully support the principal objective of Clean Air in London which is to seek the improvement of the environment and public health’. ‘However, as Mayor of London, I need to retain independence so that I can take the course of action that I feel will most benefit Londoners having considered a wide range of views. Therefore, I feel that it would be inappropriate for me to become an honorary Founder Supporter of Clean Air in London, although I will support it in any other way I can’. Simon Birkett went on to say “On behalf of Clean Air in London, I would like to thank warmly all those who have accepted this invitation in recognition of all they have done and are doing to improve air quality in London. I would also like to thank Mayor Johnson particularly for his letter of encouragement and personal demonstration of support for seeking the improvement of the environment and public health. * Please note that Clean Air in London’s individual or other supporters may or may not agree with its stance on every issue.